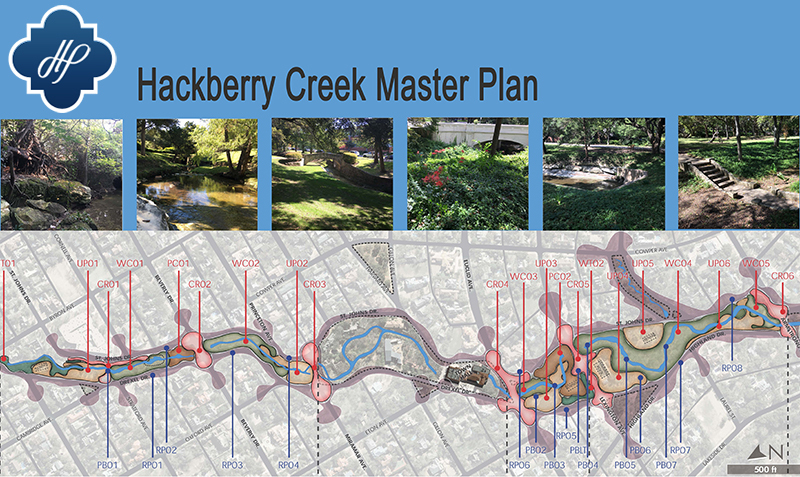 What is the Hackberry Creek Master Plan? When complete in 2018, the Hackberry Creek Master Plan will be a conceptual design document to recommend, prioritize and guide future design efforts for conserving and restoring Hackberry Creek. Improvements are intended to enhance the natural beauty of the creek and adjacent corridor and meet the needs of future generations. Anticipating possible improvements for the creek, the Town Council has $5,815,000 available funding provided for the project in the Town's ten-year capital improvement plan. What are the study's geographical limits? The study will be limited to the Hackberry Creek channel, which begins near Byron Avenue and runs generally southward as the creek flows into Connor Lake. The handful of locations where the creek crosses private property will not be included as part of the study or possible future improvements. What kinds of improvements are expected to be included in the Master Plan? Design recommendations for erosion control systems and retaining walls as may be needed to restore channel banks, bridge abutments and storm drain head walls that have eroded and/or have the potential of eroding. Recommendations for systems, products and plant materials that are sympathetic to the natural landscape and architectural stone pedestrian bridges within the creek corridor. Conceptual design of pedestrian walkways, benches, site amenities, landscape lighting and irrigation that could be integrated into the creek corridor. Continuing the legacy and natural beauty of Hackberry Creek, special care and attention will be given to improvement design and materials being compatible with existing conditions. Under the direction of the Town Council, a team of professional landscaping architectural and engineering consultants have been commissioned to conduct the Master Plan study. This important study is being led by MESA (mesadesigngroup.com) who oversaw the award-winning development of Dallas' Reverchon Park. If you have questions or comments about the conservation project, please contact Ronnie Brown, Director of Town Services, by email, or by phone, 214-559-9356.